Effective October 22, 2012, Bank of the Philippine Islands (BPI) will implement an increase in fees for cardholders withdrawing from non-BPI ATMs. The announcement was made through BPI website. From the current 10 Pesos charge, it will become 15 Pesos. But withdrawals using BPI ATMs will remain free though. BPI is the third largest bank in the country in terms of assets (behind BDO and Metro Bank). It is also the oldest bank in the country and is owned by the country's oldest conglomerate, Ayala Corporation. 7 Eleven sign in L.A. (Photo credit: Tommy Ironic) Following the move of the low-cost airline Airphil Express, Philippine Airlines (PAL) now allows customers to pay online bookings via Seven-Eleven stores. This would mean that you don't need to have a credit card to avail of their latest promos and deals. Furthermore, PAL will install ECPAY Payment Center facilities in all 766 7-11 retail stores nationwide to accommodate as many customers as possible. The customer just need to go to PAL's website, input the travel details including the destinations and the dates of flight. After clicking next, you will be taken to a page where you will be asked to choose whether to Proceed to Payment or Reserve and Hold. If you chose to reserve and hold your itinerary, then you have to log-in with your username and password. If you don't have an account, click on the "Create New Account" link to register. 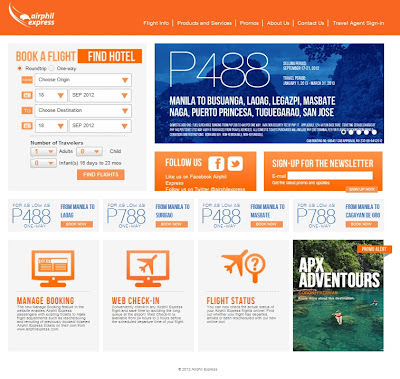 Just like the previous designs, Airphil Express still maintained its motif: orange. But this time, the contrast between the white background and the graphics make it easier to find the function you are looking for like the Manage Booking, Web Check-in and Flight Status. American Idol logo 2008–2011 (Photo credit: Wikipedia) Jessica Sanchez along with the top 10 American Idol Season 11 finalists have arrived in Manila early this morning. The 10 finalist will be having a concert this coming September 21 and from today until then, they will be very busy touring the malls in Metro Manila to promote not only the concert but also their album: American Idol Highlights. As early as last month, August, the Office of the President have already issued the list of holidays for next year, 2012. Proclamation No. 459 s. 2012 list all the regular, special non-working, special working (for schools only), and movable holidays. Unless otherwise deemed necessary to move any of these holidays, the dates were already fix. The Department of Labor and Employment (DOLE) was given the charge to promulgate guidelines for this Proclamation. What is a universal bank or unibank? Well, universal banks are licensed to do many kinds banking activities covering both the activities of a commercial bank (loans, time deposits, savings) and an investment bank (underwriting, issuance of securities, assisting companies in mergers and acquisitions). In the Philippines, the Bangko Sentral or the Central Bank has the sole right to issue licences to banks who wanted to operate as a unibank. As of August 1, 2012, the Philippines has 21 Universal Banks. Here' the list of them. 1. Banco de Oro Unibank, Inc. I've been flying domestic flights for about five years now since I started working in Cebu. Through the years, I have witnessed the growth of the number of travelers and the changes in policies of local airlines. For instance, before the second half of 2010, you can still bring your umbrellas with you inside the cabin. But, sometime on the on the second half of that year, things changed: you are now required to check-in your umbrellas. In my opinion, in some if not most, of the changes, people are not well informed. So they usually find themselves arguing with the ground personnel. But in most of my experience, the airline companies is less considerate when it comes to making exceptions. For example, because of the "umbrella" policy change, my friend was forced to leave hers at the airport just to make it to the plane. In some cases, people paid extra baggage just to check-in their umbrellas. I've been studying for over four years now regarding investments and personal finance but it seems that I don't have the courage to take the first step. Well, it was my brother who told me about it. He started investing in 2006 starting with his company cooperative and then later, he entered into Mutual Funds. My bother showed me a book, written by Francisco J Colayco entitled "Pera Mo Palaguin Mo (Wealth Within Your Reach). It was a best-seller book in personal finance. Actually, when my brother told me to read it, I was a little bit skeptical. You know, I'm not fond of reading books. But when I started reading the first few pages, I was amazed on how simple the words are. Actually, the book is written for OFWs according to the author.